Dave: Do you want to DoO the thing? Nick: Was that a pun? Dave: I think “pun” is way too generous. That was just me being lame. Nick: Yeah, I’m good to go, I’m just editing the podcast. Which, speaking of lame, has so many “Um’s” and “Yeahs” between Andy and I, that it’s taking forever 8 times longer than it did to record. Dave: Hahaha. I’m so angry/jealous I’m not physically present to do those. But I also acknowledge that with my schedule it would be hell on wheels for us to figure out when to do it. Nick: Well, there’s always Skype. And, more importantly, me figuring out how to use Skype to record things. Dave: Yeah, I know Steve Austin just uses Skype to do his. Because his guests occasionally joke about how weird it is to see his face reacting to the stuff they say. Nick: Did you see the announcement of the WWE “Network”? Dave: Yeah. Super annoyed it’s not launching on Wii U because I have no intention of buying a XBox 1, PS4, or Roku and I don’t just want it on my laptop. Because that’s lame. I’m sure it will be out for Wii U at some point, just not at the launch. Dave: Yeah, I heard they’re really inexpensive, too. Nick: I got my mom one, and it’s really easy to set up. If the Network wasn’t on the PS3. I would have just re-gifted it to myself. Dave: 10 bucks a month is ridiculously affordable for the library, new shows, AND pay per views. It’s hilarious that WWE is simultaneously negotiating a HUGE TV contract AND encouraging people to cut the cord. Like, obviously Raw and Smackdown will stay cable exclusive for at least the next few years. But it’s just a huge middle finger to cable/satellite companies to cut them out of PPV. Nick: Yeah, Raw is definitely staying because that’s a television institution and it’s a huge part of the USA Network “brand”. Nick: I could see them doing something like they did with Saturday’s Night Main Event, but on Mondays. Once a month, Raw on NBC instead of whatever flagship reality cooking competition show involving sad bachelors. Nick: But, what I was originally going to say was, Steve Austin was there. And he was Steve Austin and Stone Cold and it was weird and it made me think about what Ric Flair is really like. Dave: A guy every bit as paranoid as the character he plays on TV is confident? Nick: Is that why he’s never really been successful outside of wrestling? Dave: You and I have a mutual friend who I think put it the best: Ric Flair is addicted to the pro wrestling business. It’s not healthy at all. Nick: Yeah, he seems to be unable to function properly without it, which seems to inflict only maybe Hogan more. Dave: Hogan looked to have broken through with Hogan Knows Best, but then what happened to his family… well, happened to his family. And now he’s as bad as ever. Nick: Yeah, Hogan needs to be famous, Ric Flair needs to be a famous professional wrestler. But, thank god for him, he’s really really good at being a professional wrestler. Nick: It’s because he’s a great face and The great heel. Or rather, it’s what makes him. Dave: Absolutely. He played both to the hilt, and as I hit on earlier this week, he knew how to have a heel Ric Flair and a babyface RicFlair who both rang true as Ric Flair. Unlike, say, a Randy Orton, who went almost two years without figuring out who babyface Randy Orton was. Nick: Yeah, and he’s still not as good a heel — although I’d argue he is a VERY good one — as Flair is. Dave: No, definitely not. Orton’s heel character is all about terrible actions (kicking people in the head, etc.) and then bragging about them in the promo. 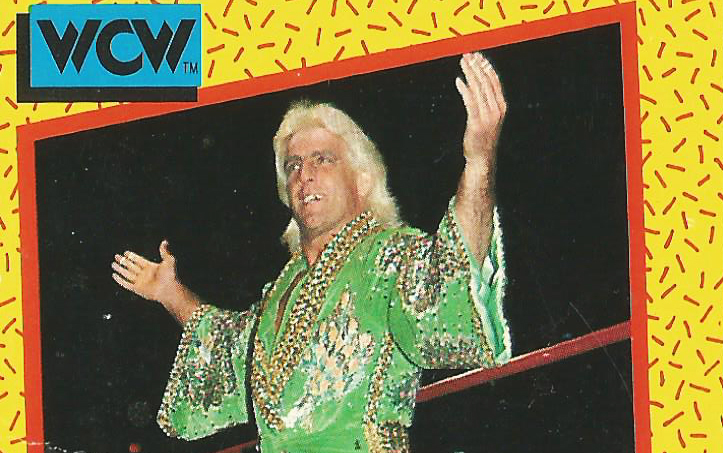 Whereas Flair could just brag about being Flair and didn’t need the crutch of having kicked a woman in the head. Nick: You have to give the people what they want, David. Face Flair is really interesting to me, specifically. His ability to do AWFUL things and just get the crowd to not care about them is awe-inspiring. Dave: I think part of that has to do with him being a holdover from (and the last great avatar of) the regional era. He and his gang could smash Dusty’s arm or leg and be the biggest heels in the Carolinas, but when fans in the Carolinas had the option of choosing between Flair and wrestlers who were seen as outsiders, they would say, “Well, at least Flair is OUR jerk.” So when JCP became WCW and went truly national, Flair had this base of rabid local fans who were willing to help him get over as a face. Nick: I also think there’s a sincerity to his performance, and the fans see that. As cheesy as it sounds, he really seems to care about entertaining the fans that makes it so you can’t help but to root for him on some level. Dave: Oh, definitely. People have criticized both Flair and Arn Anderson as being marks (in the sense that they cared what the fans thought), but I think that’s the exact reason why they were such respected performers for so long. And, once again, Anderson was a guy who could also switch from face to heel and not lose credibility. Nick: Tough guy is a portable trait. Dave: Yeah — and the most under-utilized gimmick in 2014. Back to Flair, though, I think you’ve hit on something really important. His connection to the fans was a decade ahead of its time. It wasn’t really until Bret Hart and Steve Austin that main event stars concerned themselves with actually entertaining the audience. The goal before had just been to get their money. And I think Flair really helped change that, consciously or not. Nick: It actually reminds me of, on some level, Cena’s reaction from hate. “Love or hate him, you gotta respect him” seems to be the thruline for guys at that level now, albeit with Cena, he’s the face version — where no matter what they do they can’t everyone to cheer for him. Although, I’m not exactly looking forward to a 52-year-old Cena getting obliterated by Roman Reigns who says “I’m sorry, I love you” before spearing him in half, but I think they both have that weird “I need to entertain the fans” thing that so few guys have. Dave: I think Cena is the ultimate post-Flair. The WWE found the things that made Flair great: his promos, his love affair with the crowd, his in-ring work, his presence… and then they rendered them down to about 85%. He has the same skill set as Flair, but he’s 85% of Flair in every category. Nick: Which isn’t even a knock, to be honest. Because Flair is arguably the best-a-lot-of-things. Dave: Oh, definitely not. Most guys aren’t 10% of Flair. Haha. Nick: He’ll almost inevitably beat Flair’s record of titles, because the one guy (Vince) at one comapny (WWE) gets to decide those things as opposed to a committee. Nick: It’s a fundamentally different business in terms of accomplishments. Dave: Absolutely. Flair existed before the business was reshaped in Vince McMahon’s image. He’s the one anachronism they’ve actually embraced. Nick: You have to, especially when he had probably his best run — and one of the best runs ever — in your company. Dave: Yeah, his first WWF run is just indescribable — well, I tried to describe it in Better Know and Essential Viewing, but you just have to get the DVDs, find the clips on YouTube, and relive the whole thing. He went from captaining a Survivor Series, to winning the Rumble, to wrestling the best WWF worker of the 80s and the best up-and-coming worker of the 90s… and then he’s just gone. Crazy. Nick: He MADE the WWF as a professional wrestling company more than anything Hogan ever did. Nick: Between that, the surprise return of Ultimate Warrior in the second to last match and the piper-hart match alone It’s a completely different show if that’s what ends it. Dave: Definitely. I think, in a sense, McMahon didn’t want to put the pressure of living up to Flair on other main eventers. He knew Flair was so good that he couldn’t over-emphasize it for fear that others couldn’t follow it. Nick: But they’re probably going to keep trying until the end of time.